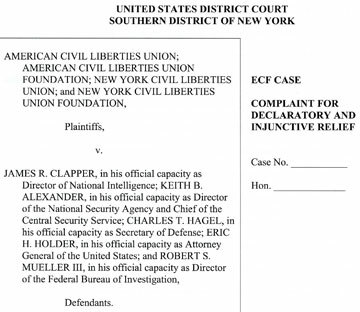 The American Civil Liberties Union (ACLU) filed this lawsuit in the U. S. District Court Southern District of New York on June 11, 2013, against JAMES R. CLAPPER, in his official capacity as Director of National Intelligence; KEITH B. ALEXANDER, in his official capacity as Director of the National Security Agency and Chief of the Central Security Service; CHARLES T. HAGEL, in his official capacity as Secretary of Defense; ERIC H. HOLDER, in his official capacity as Attorney General of the United States; and ROBERT S. MUELLER III, in his official capacity as Director of the Federal Bureau of Investigation - Defendants. June 16, 2013 New York City, N. Y. 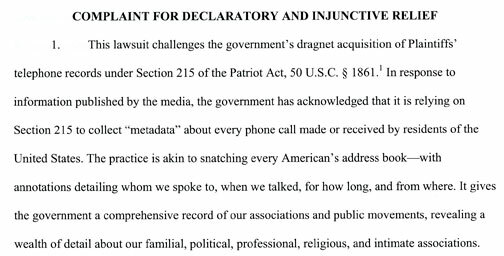 - The June 5th, 2013, edition of The Guardian newspaper in England shocked the world by reprinting a 4-page leaked and highly classified document signed on April 25, 2013, by a federal judge working in the Foreign Intelligence Surveillance Court (FISC) in Washington, D. C. See: 060613 Earthfiles for leaked doc. Next PostNext Part 5: Military High Strangeness in Jordan? Two Men See Cow Mutilated in Light Beam with Reptoids.